I wouldn’t complain if every night was Pizza Night as long as it was Delissio Pizza. It’s the one type of food that I can never get bored of eating because there are so many fun ways to change it up! Now that my kids are getting older, John and I are finding ourselves at home alone more often. My 17-year-old daughter has her friends and part-time job. My 11-year-old is also venturing out to sleepovers and activities with her friends. That leaves John and I at home to fend for ourselves for dinner. It’s actually nice to have the quiet for a change! Over the March break, we had a stretch of days where it was just the two of us at home. John suggested heading out for a dinner and a movie, but I had a better idea. I said let’s have a date night in and make it a Pizza Night! I thought it would be nice to sit down together and relax after a long week. When the kids are here, I have to stick to a few specific types of pizza to appease their picky palates. John and I are a bit more adventurous and willing to experiment with different flavours and toppings. One of my passions is food so I was in my element trying to come up with exciting new combinations. I picked up two varieties for our date night in. 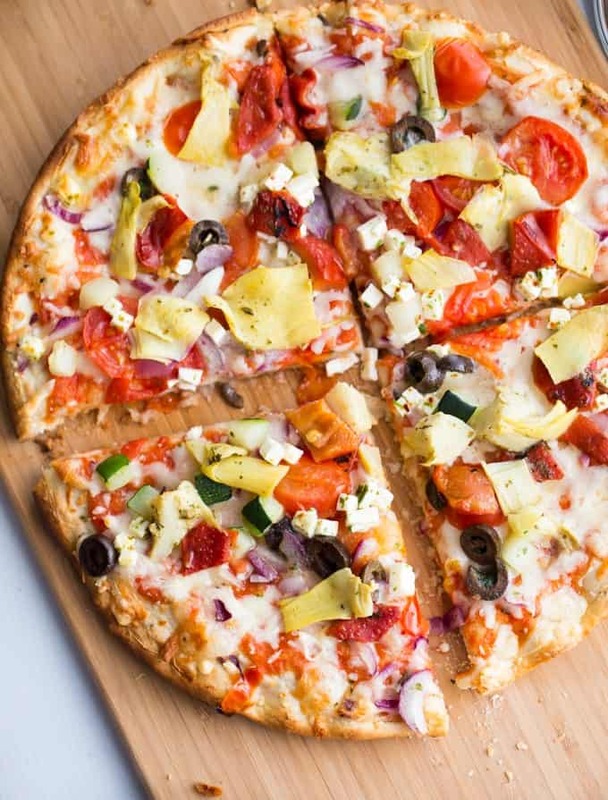 Delissio Rustico Quattro Formaggi is a frozen pizza topped with mozzarella, emmental, parmesan and blue cheese while Delissio Rustico Greek has feta-style cheese, cherry tomatoes, zucchini, black olives and red onions. I know they’d be delicious as is, but why stop there? Adding your own unique ingredient twists makes for a more memorable Pizza Night. 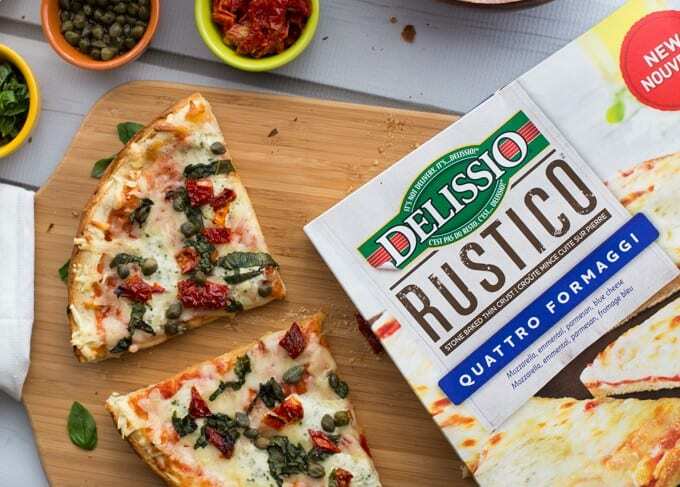 Delissio Rustico pizzas are available at Metro grocery stores, and if you haven’t tried one yet, you need to! 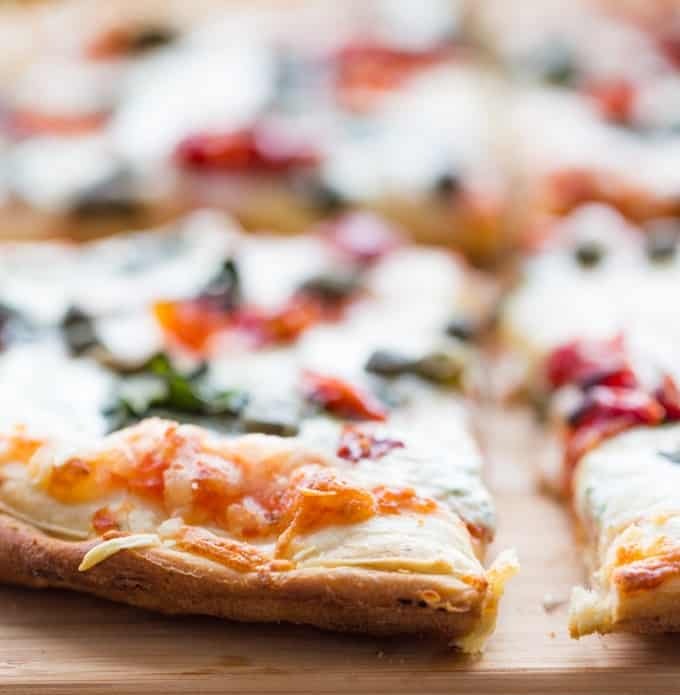 I’m a big fan of their stone baked thin crusts and fresh, premium toppings. My pizza pairing for the Rustico Quattro Formaggi was capers, fresh chopped basil and chopped sundried tomatoes. It bakes in the oven for 11 to 13 minutes and comes out with a beautiful golden crust. I selected these three toppings on a hunch that the flavours would work well together. I’ve never used capers on a pizza before and am happy I followed my instincts! I sliced the pizza up into four slices – two for me and two for John. Add a fresh garden side salad and dinner is served! We switched things up by eating in the living room instead of at the table. It’s Pizza Night, after all, so it’s ok to break the rules. We had such a blast with our date night in, we did it again the next night. 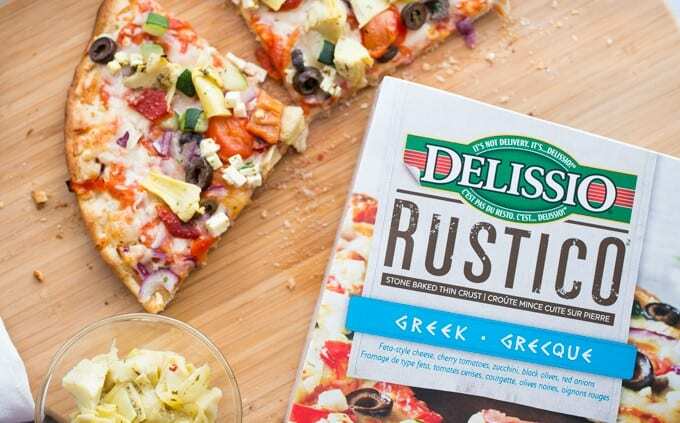 This time, I made Delissio Rustico Greek and paired it with two extra toppings: chopped artichoke hearts and fire roasted sweet peppers. So yummy! This pizza is another keeper. I loved how packed this pizza was with delicious, quality toppings! I’m looking forward to our next chance to make our date night in a Pizza Night! We shared good food, lots of laughs and most of all, spent time together relaxing and having fun. 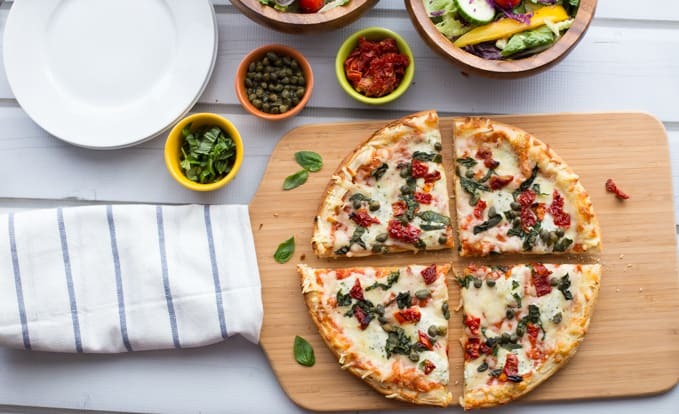 You might like these pizza recipes including Seafood Pizza, Buffalo Chicken Pizza and Chicken Pesto Pizza. Disclosure: This post was brought to you by Delissio via Mode Media Canada. The opinions expressed herein are those of the author and are not indicative of the opinions or positions of Delissio. Sounds like you had great time… and now I’m hungry for pizza. 🙂 Thanks for the share! Oh man, that pizza looks so good. Pizza is a big favorite in our family! Nothing makes me happier than artichokes and capers on a pizza! 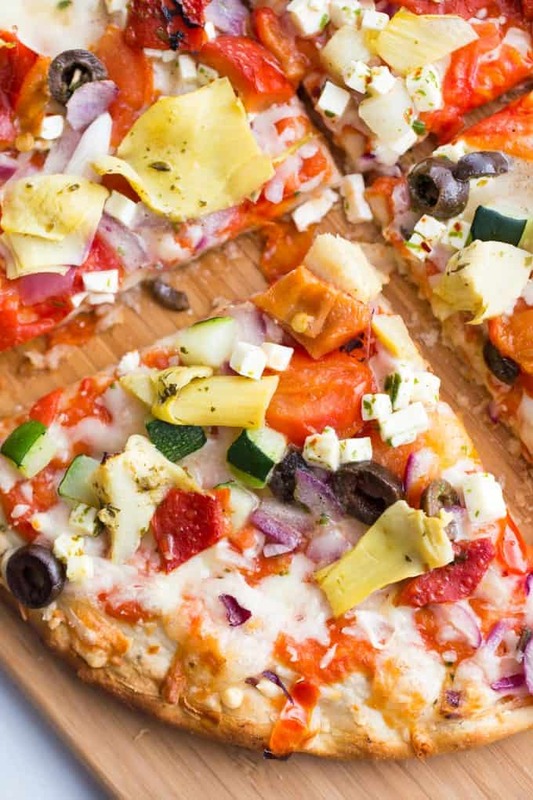 Seriously, no veggie pizza is complete without them. Delissio Pizza looks amazing! Rustic pizza is my favorite kind. it has such a wonderful, chewy texture. Pizza is our (like so many families) go to quick meal and the box stuff has come so far that I am amazed. Looks good. Love taking frozen pizzas and adding extras to them! We had this exact pizza on Saturday! It was pretty tasty! This looks awesome! We get a date night every other week when our son is at scouts. I need to try this pizza! I want to add artichoke, I love artichoke!!! Pizza is my favorite food, and I could happily eat it daily. It’s even easier with all of the yummy toppings available. I could use some sun dried tomatoes on mine next! This pizza looks so fresh! We love pizza night in our house! This looks perfect, I don’t think I have tried Delissio before. 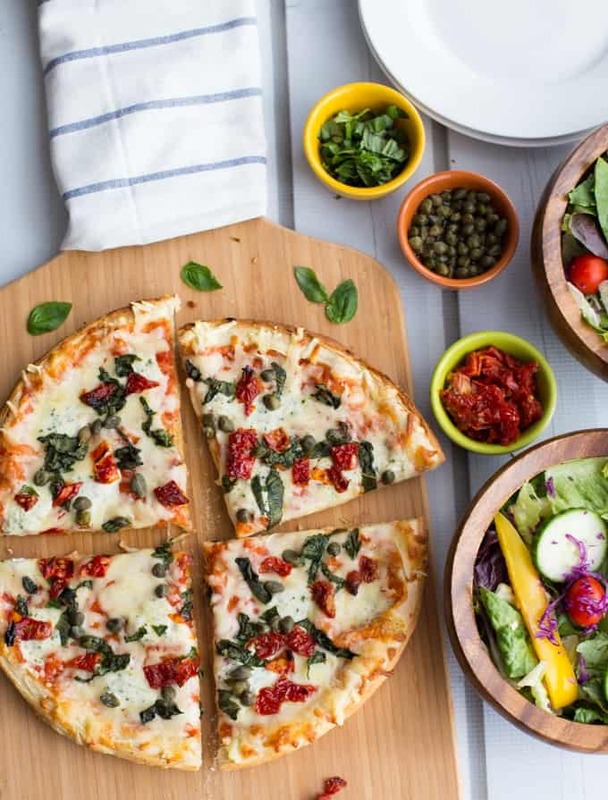 Hi…there are major probs with trying to bring up today’s recipe pizza night. First I had to reload to get the pizza to come up, your ad for Neutrogena over takes the screen. It’s the worst posting from you I’ve seen. All ads on right screen & your posting on the left is sooooo tiny I could barely read it. If this is the new style you can remove me from the mailing list & I do love your site. Just thought someone should point this out to you!!! No, it’s definitely not! It sounds like a wonky ad. I’ll email my ad network about it. Thanks for letting me know! YUM! We usually have pizza night at least once a week! I need to check out Delissio! This sounds like a great pizza!! 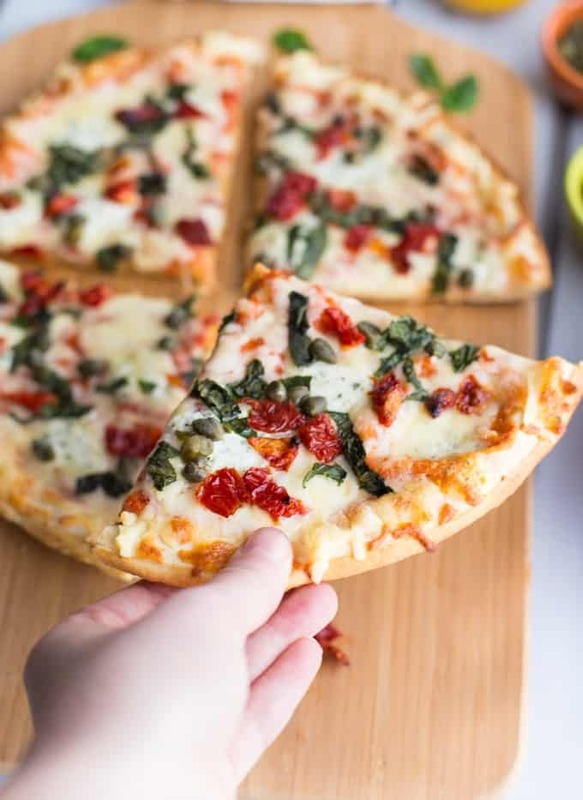 I know my kids would also love if every night was pizza night, I would love it as well. I’m totally going out to look for that Greek pizza this week! This would be a fun family dinner, for sure! 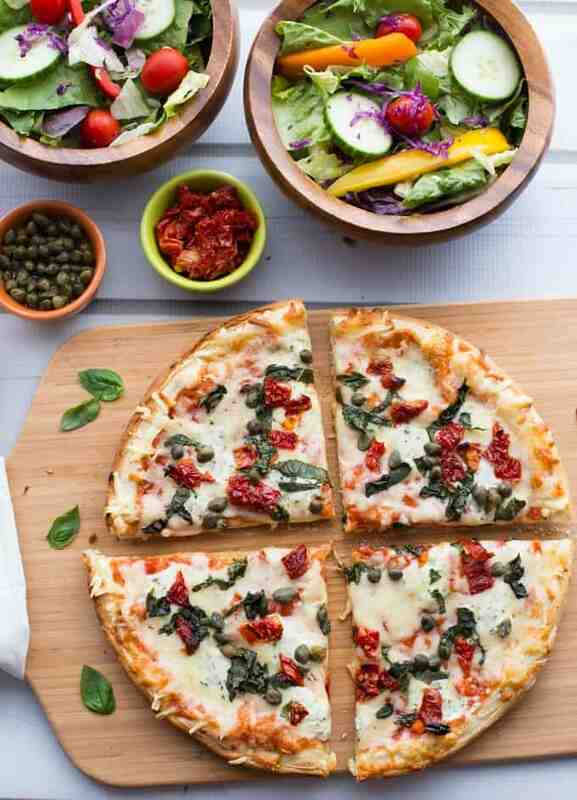 This pizza would be a delicious dinner with a side salad. I will have to pick some up this week to try. We get Delissio Pizza all the time. Pizza night is always popular with my kids. I love those toppings! They’re so rustic! Now that Delissio looks mouth-watering. I love how rustic it is. Looks like it just came out of a stone oven! This pizza looks way too good! I cannot believe it is frozen–looks so fresh! I’m not a huge pizza fan but if I do eat one I like to add more cheese, broccoli florets, onions, bacon bits and bits and pieces that are in my fridge. This pizza is perfect for me. 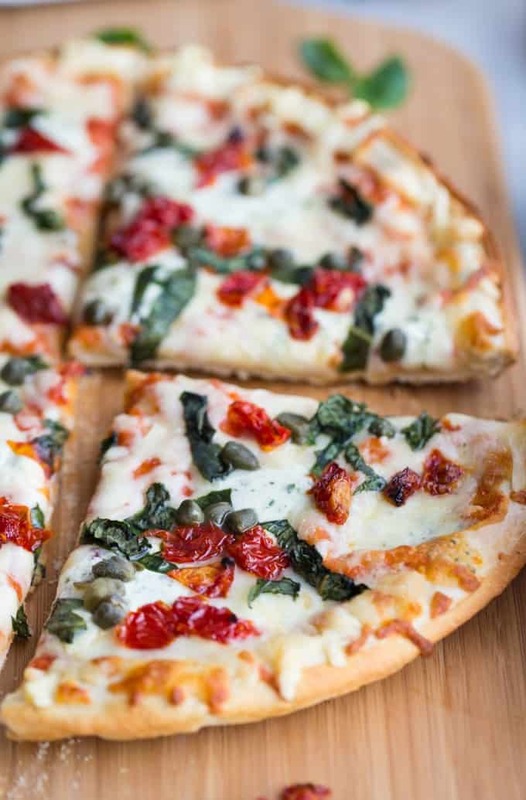 I love spinach and tomatoes on my pizza so giving this a try would be awesome. Pizza night is my favorite. I need to take a break from making it and have hubby to this for us! Yum yum! 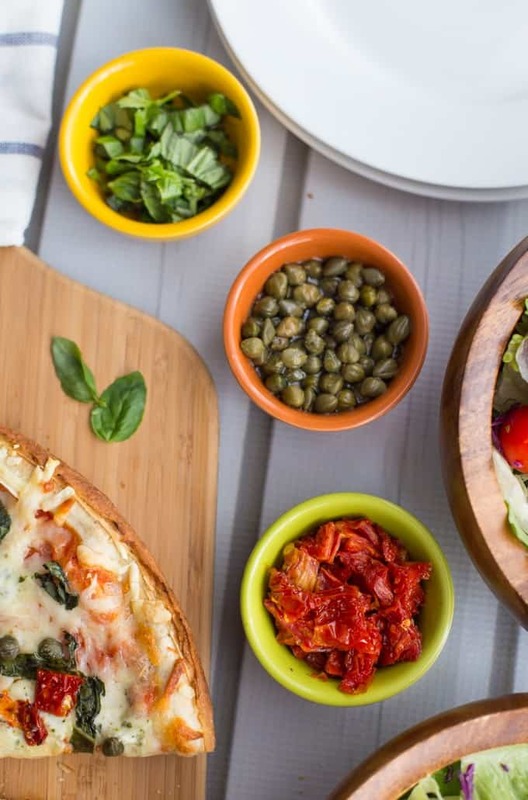 Never thought of adding capers to our pizza. Homemade pizza is sooo much better than those in a box! This one looks amazing! That looks so delicious! I never had capers before II will have to try it.